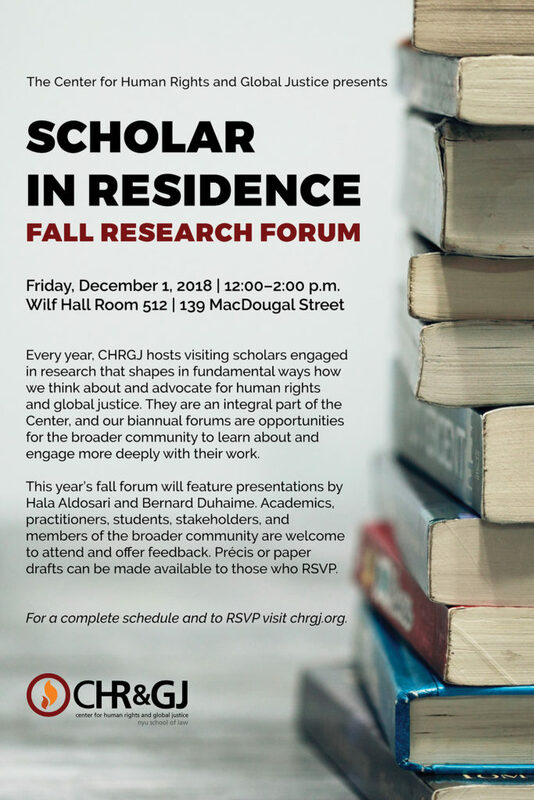 Every year, CHRGJ hosts visiting scholars engaged in research that shapes in fundamental ways how we think about and advocate for human rights and global justice. They are an integral part of the Center, and our biannual forums are opportunities for the broader community to learn about and engage more deeply with their work. This year’s fall forum will feature presentations by Hala Aldosari and Bernard Duhaime. Academics, practitioners, students, stakeholders, and members of the broader community are welcome to attend and offer feedback. Bernard Duhaime is Professor of International Law at the University of Québec in Montreal’s Faculty of Law and Political Science, where he specializes in human rights law. Duhaime is also serving his second term as member and president of the UN Working Group on enforced or involuntary disappearances. Previously, he was a lawyer at the Inter-American Commission on Human Rights. Duhaime is visiting CHRGJ as a Pierre Trudeau Foundation Fellow, as part of a project that examines how Canadians can better understand, share, and propose solutions drawn from the Latin American experience of protecting human rights and denouncing and repairing human rights violations. Hala Aldosari holds a PhD in health services research and epidemiology from Old Dominion University, where she explored intimate partner violence against women in Saudi Arabia. She has completed fellowships at leading institutions, including Johns Hopkins University and Harvard University, where she researched gender and health. Dr. Aldosari is a scholar-activist who engages regularly in research and advocacy on women’s rights in the Arab Gulf states. She serves on the advisory board of two human rights organizations and a global initiative to combat violence against women. In 2018, she received the Alison Des Forges Award for Extraordinary Activism by Human Rights Watch. Her research at CHRGJ examines the intersection of sexual and reproductive health with women’s rights in Saudi Arabia.